Last week, we learned from GeekWire that Google has applied for a patent on our bread and butter technology: tracking groups of bills split with friends. The patent application describes a system of shared balances and payments between friends in a group – exactly what Splitwise and some of our competitors have been doing publicly for years. Google currently has no group-splitting product, and one can only assume they are considering adding a splitting service to Google Wallet. (Google, if you want to integrate Splitwise with Wallet, reach out to us). Obviously, it’s “not a joke” to have a tech giant submit a patent application for exactly what your business has been doing for years. But we couldn’t help but laugh when, within the same week, a lobbyist paid by Google approached us to ask if we would publicly support a patent reform bill. We are literally being lobbied for patent reform and patent-trolled by Google at the same time. 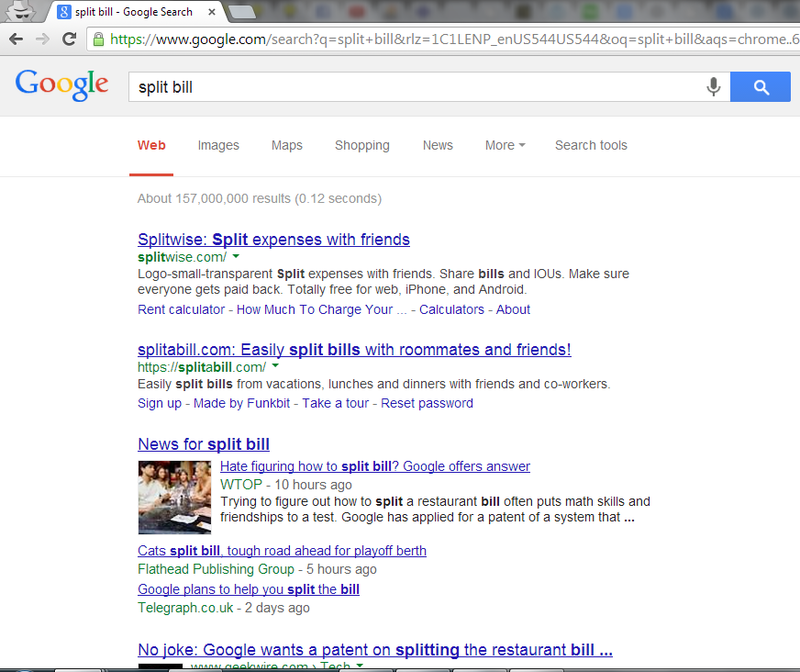 Obviously, Splitwise did not invent splitting bills either. We are improving and expanding on what products like Billmonk and many others have been doing since 2006 and before. My purpose here is not to point out the copious prior art created by us and our competitors and predecessors (if you’re interested, see the AskPatents thread). But I thought it would be an opportune moment to, ironically or not, publicly declare our support for the (Google-backed) patent reform initiatives going through Congress. Bad patents like the very one Google is now attempting to obtain are a strain on the economy and a gigantic waste of resources. Even before their application appeared, the Splitwise founders had agreed that we find most “tech” patents to be of generally low quality and mostly used as an unfair weapon. “Unfair” because it is a weapon that can only be used by those who can easily afford lawyers, and can be turned against small companies whose ideas and passions can create a better world for all of us. Probably not all software patents are bad. But the fact is that our current legal environment incentivizes Google to apply for crazy patents like a patent on bill splitting, and it is hard for us to fight them. If they get a patent issued, it becomes quite expensive for us to deal with, even if we ultimately win. Google has a relatively long history of not suing over patents, followed by some recent suits against other big companies. I don’t think their company zeitgeist is to be a patent troll, but they are clearly playing the game they are also trying to change, and this is hypocritical. All of that said, yes, let’s change the system: apparently even Google wants to. Let’s assign legal costs for frivolous patent lawsuits to the loser to reduce the incentives to apply for bad patents. We are a fairness company at heart, and as founders we trust the EFF to have thought through the policy implications that support what’s best for internet freedom. They support current patent reform efforts, and so do we. We are writing our congresspeople. 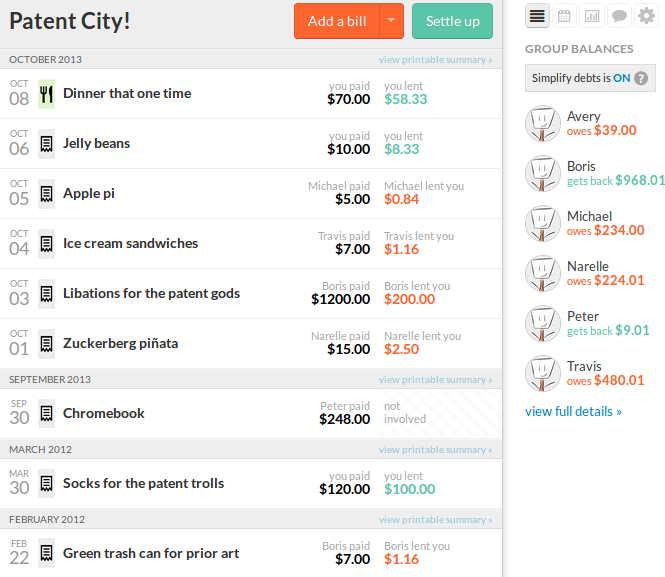 And Google: Splitwise already has integrations with PayPal and Venmo, and we have plans to integrate others. Please start working with us and stop patent trolling us and our competitors. Your friends across the pond at WeSplit.it agree too. Oh behave, Google! Applying for such a patent doesn’t necessarily mean Google will use it. There’s also no evidence showing that Google will patent troll you. 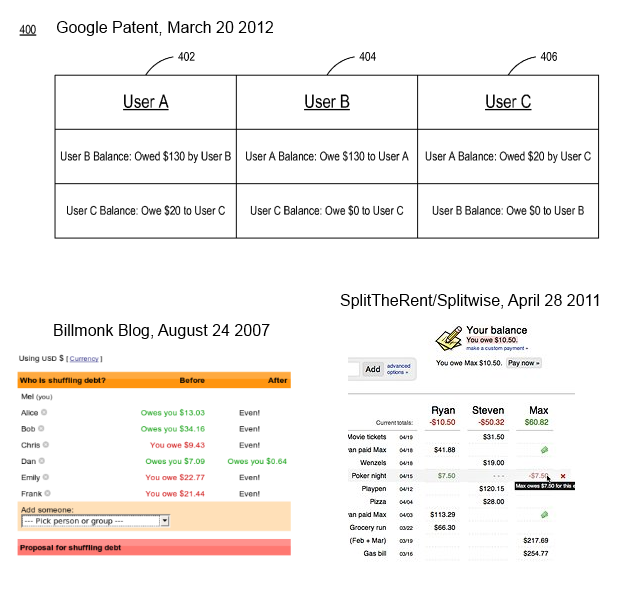 In fact, you can hardly find a case where Google being patent troll. It could be a just defensive move towards other patent trolls. I sense the rant in this article and the comments is more about the possibility of Google entering this market and not so much about patents.